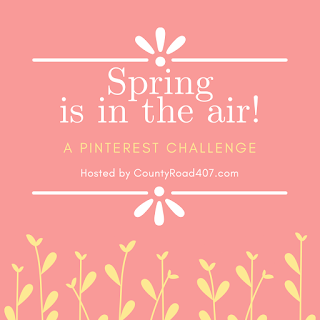 I am so excited to be a part of this month's Pinterest Challenge! I want to thank Cindy at County Road 407 who organized this event for us! I appreciate her so much! She is such a sweetheart and is so creative. If you are joining me from Le Cultivateur, welcome! If you are a regular reader, welcome back! ...we put our own spin on it! 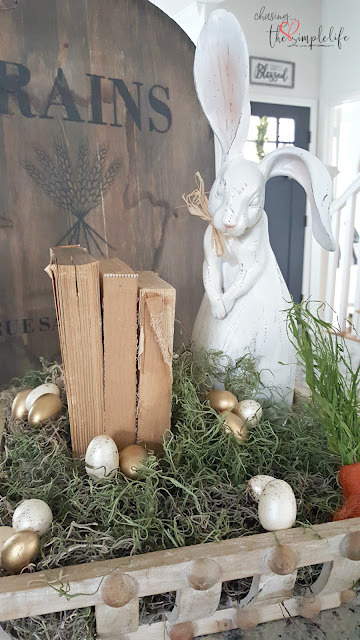 Our theme this month is Spring/Easter and the inspiration idea came from Lisa @A Simply Styled Nest. As you can see in the photo below, Lisa decorates her home so beautifully. I don't know about you, but I love Pinterest and find so much inspiration for decorating, recipes, crafts, shoes, make-up and anything else you could possibly imagine...and probably a few things you don't want to imagine! I decided to create my centerpiece to use on my island. I am still enjoying my tablescape that I created for the Springtime Tablescape Blog Hop and am not quite ready to let it go. I found this pretty container at Hobby Lobby and knew that it would be a great base. I found this sweet rabbit at Hobby Lobby also...I needed some height. I have two of his younger brothers around the house. They are always into mischief. ;-) I had eggs from previous years' decor and grabbed some of my cover-less books for this centerpiece. I also purchased some fluffy moss as filler. Assembly was pretty quick. I stacked my books for additional height and used some sturdy crumpled paper to keep them upright and in place. I used the moss to cover the bottom books and paper. I kept moving it and fluffing it until I was happy with how it looked. Instead of using the large colored eggs, I decided to use the mini gold and off-white eggs. They looked much better with the books. After arranging the eggs, I added the carrots. The carrots gave it a great pop of color since the tone of the centerpiece is pretty neutral. Just to let you know, I had a totally different look for this centerpiece when I started. I had used lots of flowers and the big colored eggs...that centerpiece made me a nervous wreck. If I had used my large vintage dough bowl I think I would have liked it, but with this smaller container it looked crowded, busy and haphazard...not me at all. I ripped it all apart and started over. This look works much better for me. I hope you will take time to visit all my other friends who are participating in this Pinterest challenge! They are all so creative and I think you will enjoy their centerpieces. If you are "hopping" along in order, Carol at Art and Sand is your next stop. Be prepared to get some great inspiration for your Spring/Easter table! I love the books. What a wonderful addition to the display. It's an adorable display. Thank you so much! 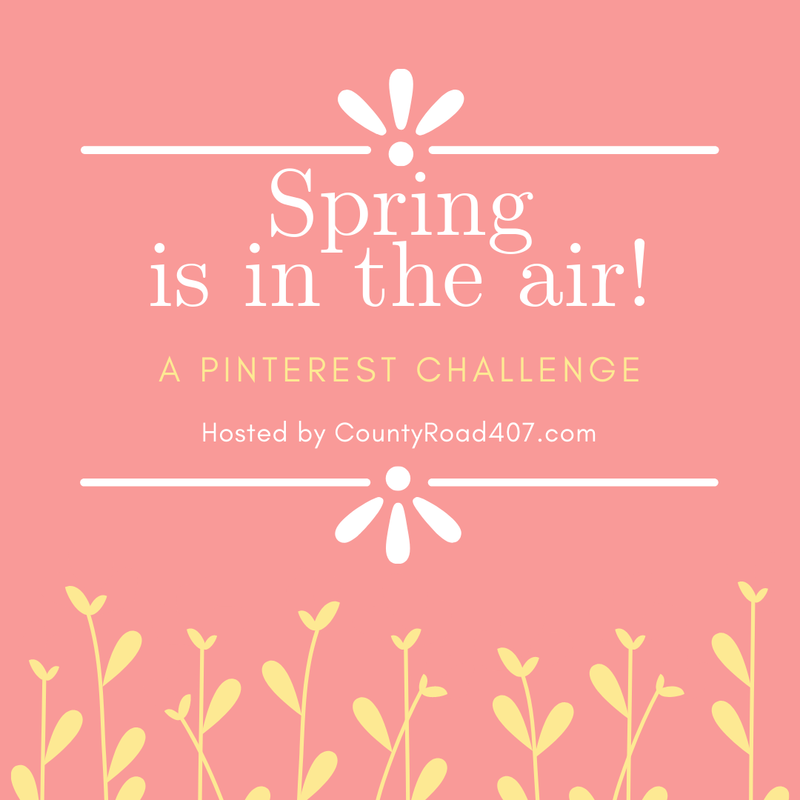 I enjoyed the Pinterest challenge and am looking forward to participating again! Hugs! This is absolutly adorable! I need some inspiration for a center peice. Easter is one of my favorite Holidays. I love Spring! So far my center piece is a pastel cupcake stand.....full of cupcakes!!! I’m dying. Haha. Thanks so much! I'm not good at creating centerpieces on my own, but can usually pull a few ideas when I see other ideas. I think the cupcakes work...just eat one a day...like a vitamin! :-) Hugs! This is awesome Benita. I hope your little Bunny will be telling us Spring is near. Your version is so pretty, Benita! I love the colors you used and the carrots give your centerpiece the perfect pop of color. Thank you Paula! I've been trying to add gold-colored touches throughout the house so the eggs were perfect. The carrots definitely add some much needed color. Thank you again! Hugs! What fun! I love your take on the centerpiece, very creative! I have 2 of those sweet HL bunnies, I decoupaged mine and I just love them! Love the carrot pop! I must visit the others, have a great week Benita! Jenna, thank you so much! I love those little bunnies. One is in our bathroom as a permanent doorstop…LOL Hope you are having a great week and that you guys are having some good weather! Hugs! Thanks so much Penny, I enjoyed participating. Hope you are having a great week and having some decent weather! Hugs! I adore your centerpiece. That rabbit is so darn cute! Thank you! HB has some of the most adorable rabbits! Hugs! I like your smaller, quieter version. Very pretty! Your bunny looks just like the inspiration pic; score! Thank you Lora! I tried it the other way (with flowers and colored eggs) and just wasn't pleased with it for my home. This worked much better. I was glad to find one in almost the same position. :-) Hugs! Benita, this is so pretty! I had just seen the inspiration picture on another blog and it reminded me that it was not too early to think about Easter and then I found your post here. 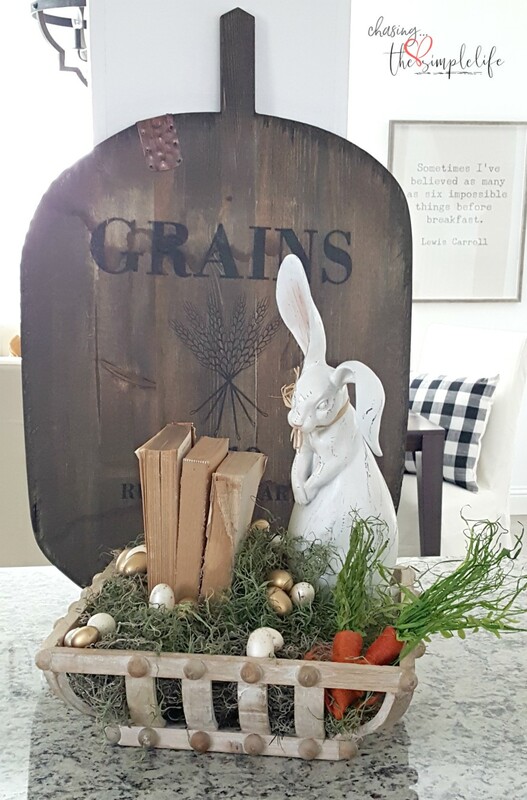 I really love your Easter centerpiece and your darling white rabbit! It reminded me that when we moved here, I brought in a green garden standing rabbit that looked as if it had sat under a holly bush for years. I've never done anything with it but there it sits, stuck on the floor with the Christmas wrapping paper. 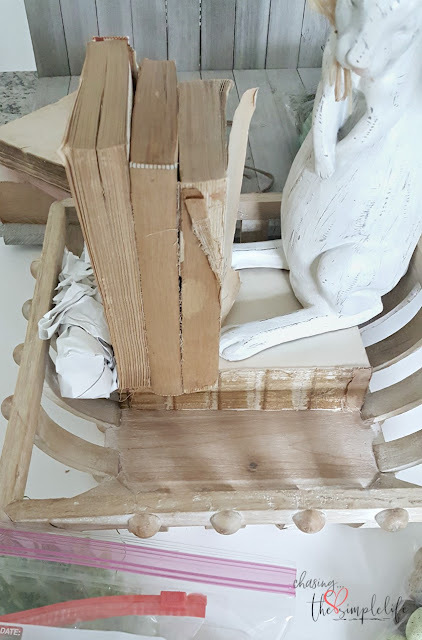 I'm putting her on my dining table today and with your inspiration will see what I can come up with, even if I don't have a container with as much character as yours.I'm finding out that containers are so important and I have zilch and zilch room to store them. My poor green rabbit may sit alone for a while but at least she'll be prodding me to do something, sometime. Thank you for the inspiration! I love how it turned out. So adorable. I need to at least get a tablescape accomplished but oh so slow popping back from being sick. Much better praise the Lord. 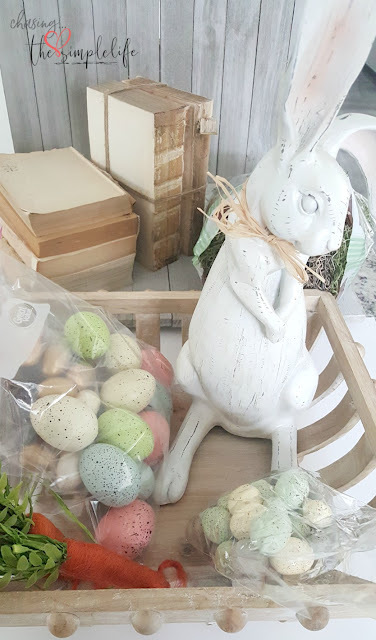 I have been given an easter bunny and a pretty easter bunny platter for gifts so will be using those items for sure. Love how it turned out. Hugs and blessings, Cindy P.S. Thank you for praying for me. Thank you so much Cindy! Please take it easy and get your health back to normal. It is hard to get back into the swing of things after being sick like that. Since you’ve been giving a few things, I know you will be able to make something beautiful out of them! You are most welcome, will continue to pray for you…being sick this time of year is hard to get through! Love and hugs sweet friend! Thank you so much Kari! The books are definitely more me than all the flowers and eggs...and believe it or not, that orange is growing on me. May have to throw some colored pillows in my all neutral palette. :-) Love and hugs to you! Sweet, Benita.. I love the bunny! Thank you so much Carla...he's a sweetie! Love and hugs! You went with your instincts and they didn’t let you down. It’s adorable and perfect for spring! Thank you so much Doreen. The first deal I created was a hot mess...I couldn't sleep...LOL That sweet little bunny looked like he was a Chucky doll and ready to kill! :-) Love and hugs! 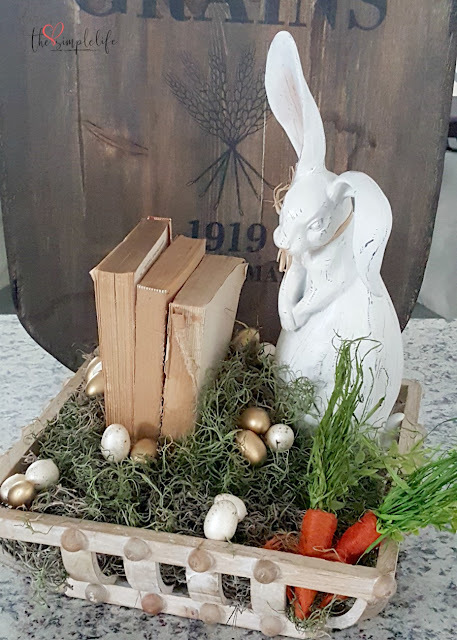 Oh my golly - the bunny, the books, the golden eggs, the basket... it's all so stinkin' cute! Adore your style and creativity Benita. Thanks so much for joining us today. Cindy, thank you so much! It fits my home better than the pretty flowers and eggs in the inspiration piece! I loved your centerpiece…so pretty! Thank you again so much, I really enjoyed participating and look forward to doing it again! Did you decide about doing it monthly? Hugs! I am totally blown away by how different all of our centerpieces are! LOVE your shy bunny, Benita! <3 And you're right, I like this smaller basket with the tall pieces in it. A quick story... I lived on Oahu in the early 1970's (my dad was in the USAF) and in the 4th grade, I found the golden Easter egg in our school's egg hunt! Love your golden eggs!!! Me too Barb! I just love everyone's creativity and how different every single centerpiece is...everyone did a fabulous job! Oh, that is so awesome! Did you love living in Hawaii? I've never been but have heard so many wonderful stories! The golden egg is always the best, right?! ;-) Have a great one and hope you are getting settled into your new home! Hugs to you!! Love this, Benita. It's so calm and sweet. Those are the words that come to my mind when I look at it... Oh, maybe 'serene' is even better! Loved 'hopping' with you, sweet friend! Thank you so much Julie! 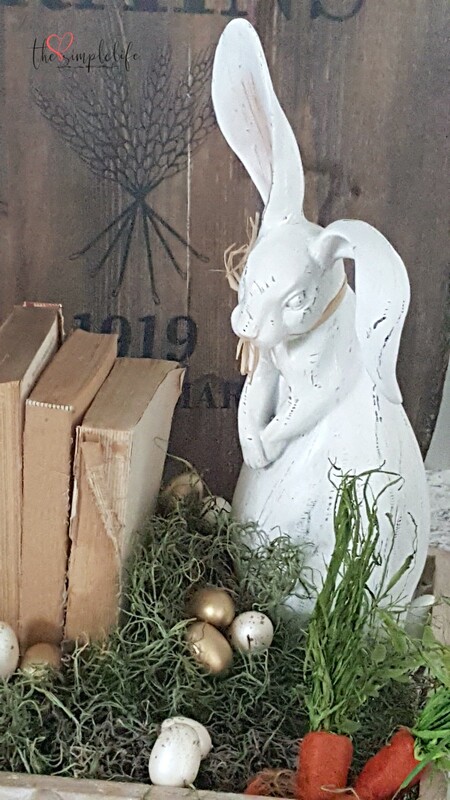 I needed calm, sweet and serene after that first nightmare I created...my husband thought I had lost my mind and said he fully expected the bunny to hop away during the night...LOL I've enjoyed this hop so much and love everyone's creations...all so pretty and different! Hugs sweet friend! What a sweet vignette! I just saw that rabbit at HL. I now really regret not buying it. I guess I need to head back. LOL! So pretty! Thank you so much! Those little rabbits they have are just the sweetest! There is always something at HL that I regret buying and always have to go back...LOL. Hugs! Well, that is just darling! Thank you so much! I enjoyed trying to recreate something someone else did and all these ladies are so creative! Love and hugs to you sweet friend! That is lovely, I do find the rabbit so sweet! I think that would be a fun challenge, I might find something on Pinterest and try my spin on it. Actually, I am challenging myself to create something later this week! I will be sharing it next week! Thank you so much Chloe! I had thought the same thing about challenging myself to create more things I see on Pinterest. There is so much wonderful inspiration out there and I hate just pinning it and doing nothing with it…so there should, hopefully, be more recipes and more projects on my blog. Fingers crossed! 😊 Hugs!! Your bashful bunny is adorable and I like the old books you used. Thank you so much! Old books are always great to decorate with...they are my "go-to"! Have a great one! Hugs! This is so adorable! 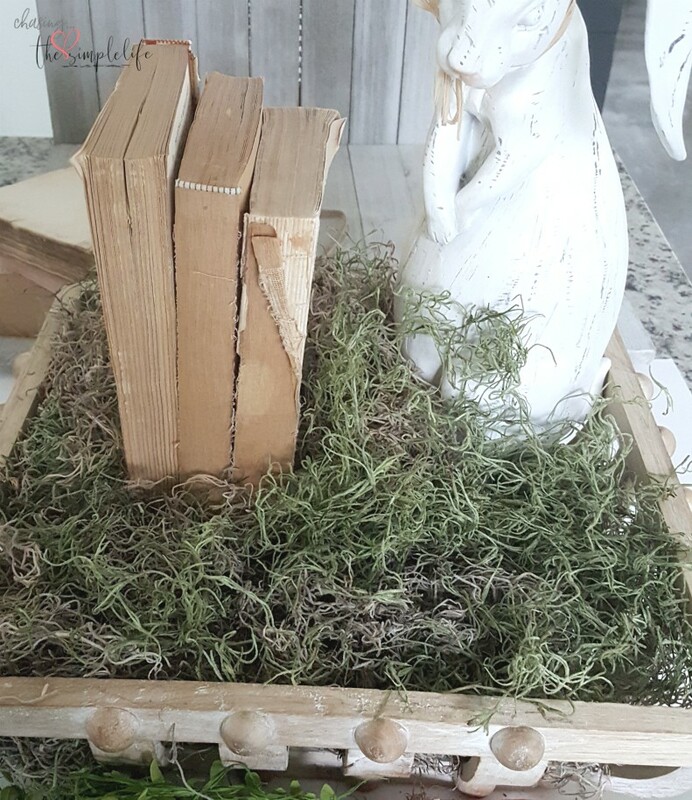 I absolutely love that basket and the old books and moss as filler. You have styled a beautiful centerpiece for this challenge! Thank you so much Amber! I appreciate it greatly...this challenge was fun and I'm looking forward to participating in another one! Hugs!